I can't believe we're at the second to last "topic" link up already! The linkup for topic #5, Creating Your Own Designs, is still open for two more days, so feel free to write a blog post on that topic separately. There are 6 great posts to read over there! Today's topic is super near and dear to my heart: showcasing your work. I'll be posting about this sometime within the next two weeks, but today my friend Laura of Little and Lots is here. She's written a fabulous post about ways you can show off your hard work, and WHY you should! Thanks to Jess of Quilty Habit for inviting me to write this post as part of her smart and informative Sewing With Certainty Series. Follow the link to check out the back issues of this series, and to see who-all is setting goals and linking up! You stayed up late last night, but it's done! The last stitch is sewn in the binding; you made your spouse stay up even later to move the quilt from washer to dryer. This quilt is done. Or is it? When I first started quilting, I would take any old photo of my quilt to show that it was done. I photographed it the night I finished it, wearing pajamas, indoors, with clutter all around. I couldn't figure out why I wasn't getting good photos of my quilts! In addition, I wasn't sure that my quilts were worth shouting about. They were just quilts. I wasn't a big, famous blogger with something new to say. Now I would argue that a quilt isn't finished until you have taken good-quality photos and shared the quilt or the photos with other quilters. Whether you're just sewing the binding down on your very first 5'' square patchwork quilt, or finishing the queen-sized double wedding ring quilt you hope will become a family heirloom, your quilt deserves publicity--and YOU deserve attention, applause, and encouragement for finishing it! 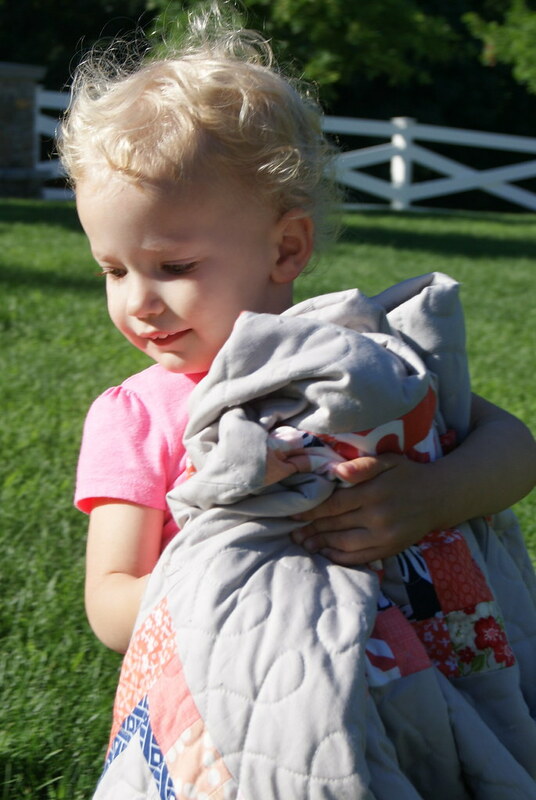 1) Treat a quilt photo session like a crucial step in the process. Act like it's as vital to take lovely photos as it is to iron your blocks. Don't give away or sell a quilt before you take pictures. Don't make do with poorly-lit indoor photos. If you gift that quilt, you may never see it again--take photos that will act as your personal quilt portfolio. Several of my blogger friends take GREAT photos using just their iPhones. You don't need to have a fancy, expensive DSLR to take charming photos. You do need to give the process a little time. And you might need a friend or spouse to help you hold the quilt. 2) Post that photo--the one you can't believe YOU took--on the internet. 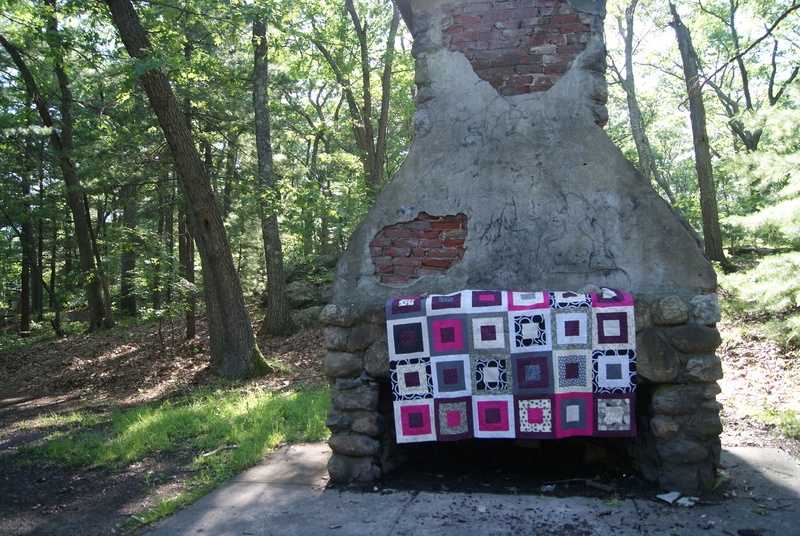 If you make quilts, you need a Flickr account. 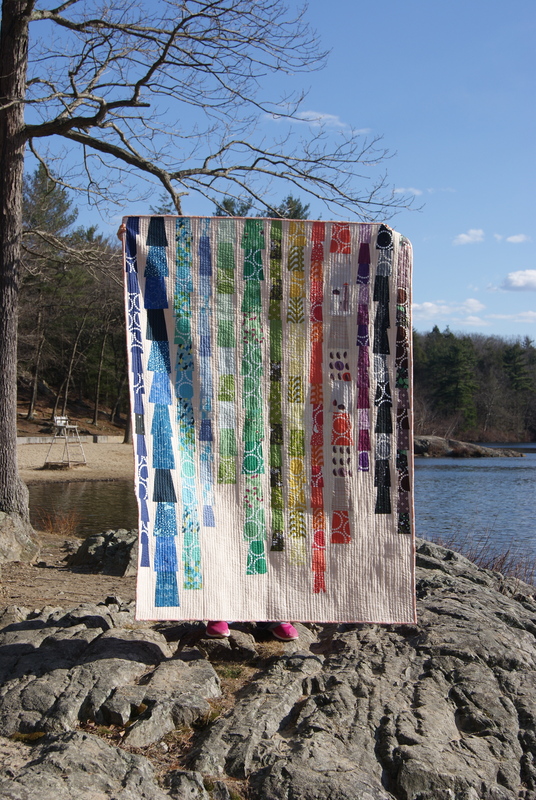 Post your quilt photos to Flickr groups so that other quilters can see them. Have you designed your own super-sleek, mod, scrap quilt? Put the photo in the Fresh Modern Quilts group on Flickr. This is the motherlode of modern quilt photos, and is a surefire way to get your quilt seen by other modern quilters. Other good groups are design-specific groups like the Scrappy Trip-a-long group. If you used a pattern to make your quilt, there are groups where you can, for example, show off your brand-new Elizabeth Hartman-designed quilt. Adding your photo to Flickr probably isn't enough. Putting it in the correct group will get it seen! 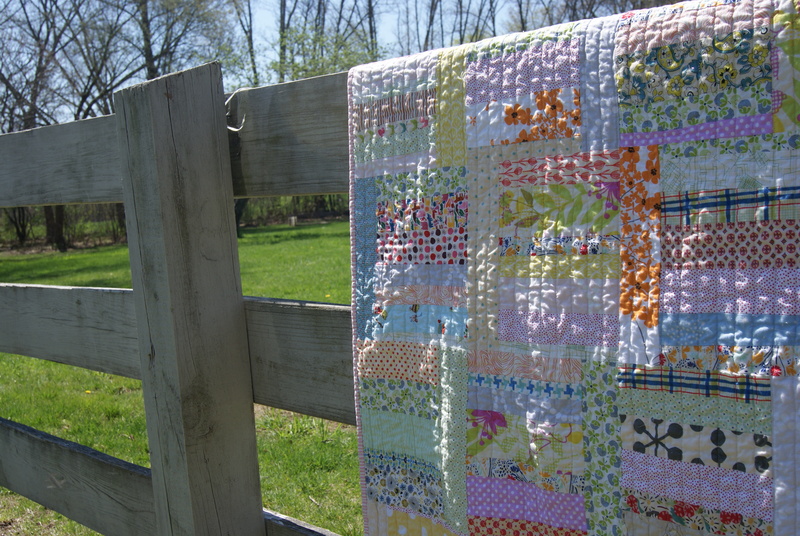 Instagram and blogs are also great places to post your quilt photos. The quilting community on Instagram is chatty and booming. 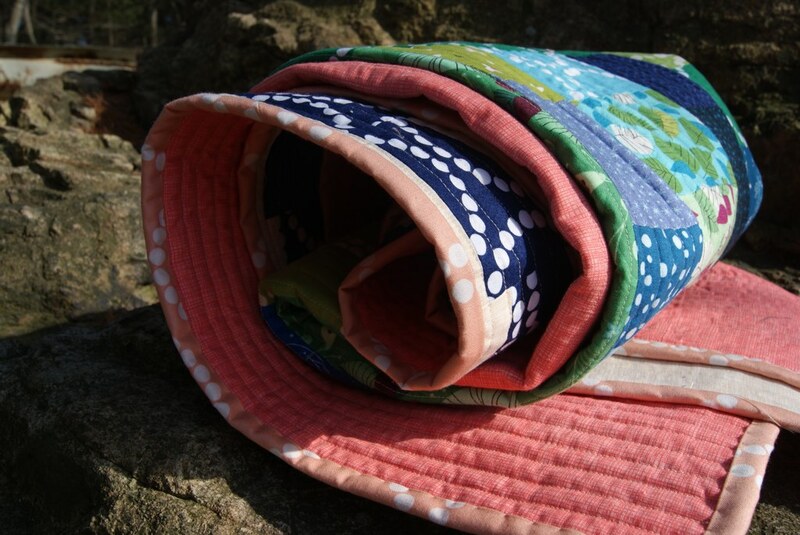 Follow people who post quilty photos and many of them will follow you right back. (I'm littleandlots over on Instagram, too!) Need to write a bunch of words or keep a project journal? You need a blog. Take the plunge--you'll be glad you did. 3) Join a quilt guild. No, really, just do it. You think you don't have time. The nearest one is 45 minutes away. You have little kids. (If you're being honest, you're worried that the group will be clique-y and unaccepting, like eighth grade all over again.) 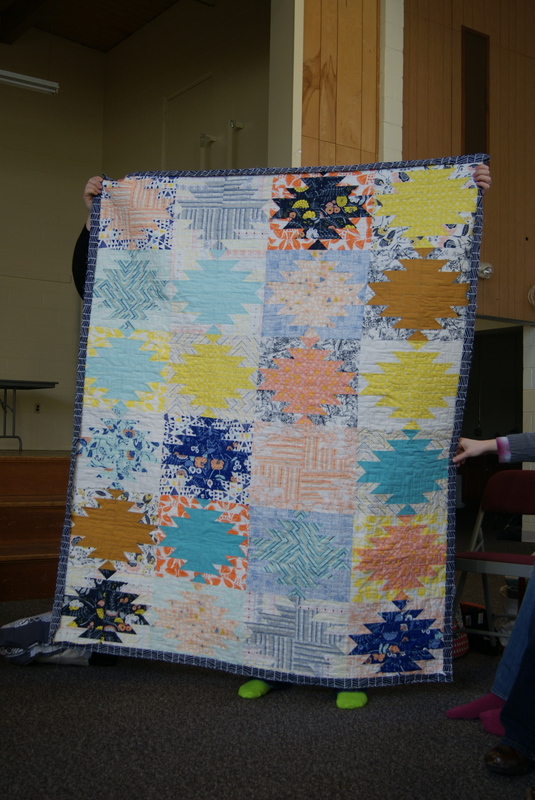 I joined the Seacoast Modern Quilt Guild in late 2012 and it was one of the best quilting decisions I've ever made. 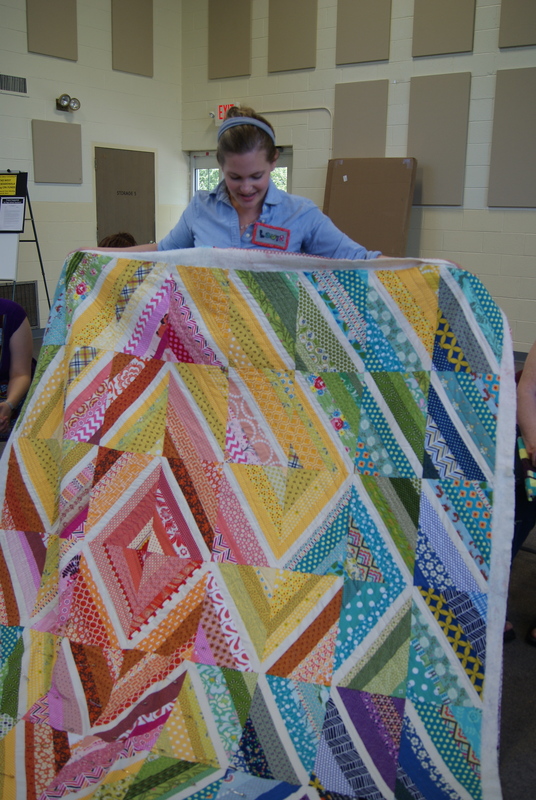 There's nothing quite like showing your quilt to a group of real people. They'll coo, and ooh and ahh, and ask questions. They'll remark over the quilting texture and ask you how long it took you to do that quilting design. (Or they'll look at a mistake you are agonizing over and tell you it's no big deal.) And then? They'll show you the quilt that THEY just finished, and you get to coo and ooh and be inspired. I've learned so much from the ladies in my quilt guild--they're a source of endless inspiration, and they challenge me to be a better quilter. Quilting is a social act. Yes, we pull ourselves aside, quietly, to finish our masterpieces with our audiobooks and Netflix re-runs. But you're making that quilt to keep someone warm, or to bring someone joy. Please consider sharing every one of your quilty makes with the growing online quilting community. We want to see them, and we want to oooh and ahhh and be inspired by you! Thanks, Laura!! Now it's your turn! Don't forget, every link you enter gives you a chance to win a fabric prize (soon TBA) from myself and 1 Choice 4 Quilting! You can enter once every two weeks with a new blog post about the given topic. What a fabulous post - I couldn't agree more! I took a quilting break for a few years where I really wasn't inspired and I realized it was because I wasn't sharing. Once I starting blogging about my quilting, it rekindled my quilting desires all over again and now I just can't stop! I've won (by getting first place for quilts in 2011 and 2013 state fair) a year's membership to the NM quilter's association twice now and still haven't gone to one single meeting. I totally worry about being the youngest, or the only one that's never taken lessons. I have little kids and getting a babysitter so I can drive across town to talk about quilts doesn't seem legit, ya know? #waystofeelmoredepressedonadepressingday So other than family that stops by or interested friends, my blog is my biggest way of sharing my quilts. Omgosh, they are all so wonderful, I don't know which one is my favorite. Love the happiness and joy they all radiate. This post is a wonderful inspiration! And filled such lovely pictures of with gorgeous quilts. But you are so right... After all those hours of hard work, our quilts deserve a photo shoot! Thanks for sharing, Laura! I totally agree about the photos. I have a mission this year to improv my photos (I am going to do a photo link in the next month or so, so I hope you'll join me! ), and there really is nothing better than quilty people to talk to, whether it's in person (we started our own guild and it's fabulous!) or on line. I am so grateful for the quilting community on the blogosphere. I don't think I would have started quilting without it. Another thing to think about, with pictures of your quilts out there on the internet is to put a watermark on your picture, so it is always identified as your! I use the free program Photoscape to edit my pictures and put a watermark on any picture I put online that includes my business name, my blog info and the year. Thanks for the great ideas!!! That Laura. So smart. I loved reading this and I may just have learned a few things too! Excellent advice! Love Laura's "join a quilt guild" suggestion - it is so true that getting that feedback in person from a big group who can really appreciate what you've made is very rewarding! From personal experience, asking the DH if he likes it as he's balancing on a stool for your shoot doesn't make for the most validating "yeah, it's great" lol ; ) So hurray for the real and the virtual quilt communities! Wonderful, thank you so much for posting. I need to continue to work on my photography. I now follow you on Instagram. I liked this post a lot, especially the tips about Flickr. I have a Flickr account and never use it but that may be about to change! I wrote a very long post for "designing your quilts" but missed the Linky party through being away last weekend. Ah, well, the post is up anyway, introducing "Violet and Friends" quilt. Very interesting and entertaining read. Thanks you. Great post -- thanks for sharing your insights in photographing quilts!